In the past, I had found some adorable Red Sox t-shirts for girls at the clothing store Justice. While we were at the mall picking up a birthday gift this weekend, I stopped into the store and found a whole new selection of Red Sox apparel. 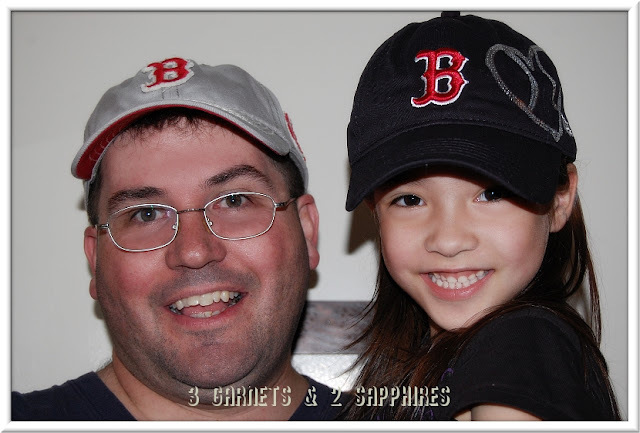 Since our daughter had outgrown her pink Red Sox hat a long time ago, I just had to get her this one with a sparkling heart-shaped baseball. It retails for $23, but Justice was having one of their 40% off the entire store promos, so I only paid $13.80. My husband also got himself a new Red Sox hat from JCPenney that day. It is a distressed gray twill and a nice change from the usually blue or red caps. He also loves that it already has that soft worn feel that he can only get after wearing and washing his hats for years.